The new iPad's Retina display is stunning for photo exhibition. 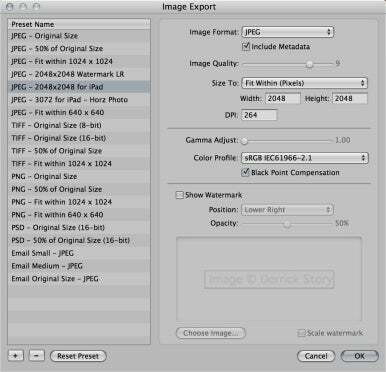 If you want to maximize this special hardware's photographic potential and manage how much space your images occupy, here are a few ideas for preparing the photos on your Mac before transferring them to the iPad. The result: Major Wow for whomever you show them to. The basic steps to do this are: prepare your pictures so they look good using your favorite image editor, move them to the iPad, view, and enjoy. 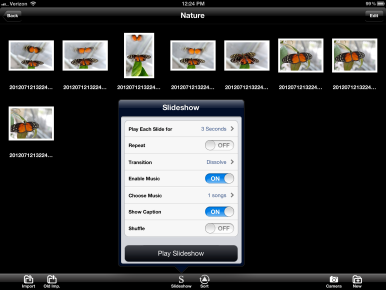 You could use the standard workflow of syncing images from an Aperture library via iTunes to transfer them to the iPad. And if all the variables are set correctly, such as using a large enough preview size in Aperture, this can work OK. But what if you switch Aperture libraries, use Lightroom, or a variety of other exceptions? The following approach tackles this process differently. You prepare the images in any photo application, export them to a folder, then upload them to the iPad using a transfer app such as PhotoSync. This method provides more flexibility and more control. You can set the exact resolution and file size instead of leaving it up to iTunes to make those decisions for you. Let’s take a look at it to see if this technique might work for you. The high definition display on the new iPad packs more pixels into the 9.5-inch screen than its predecessors. The resolution is 2048-by-1536 pixels at 264 pixels per inch (ppi). That’s higher density than the iPad 2 that weighed in at 1024-by-768 pixels at 132 ppi. To take advantage of the new iPad’s increased resolution, consider preparing your images with 2048 pixels on the longest side. 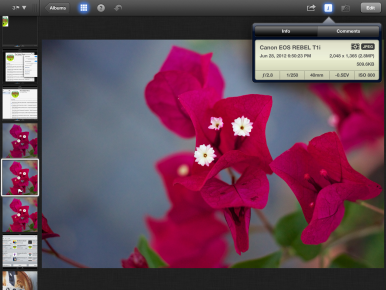 You can use practically any image editing app to get your pictures ready for the new iPad. We’ll focus on iPhoto, Aperture, and Lightroom because of their popularity. 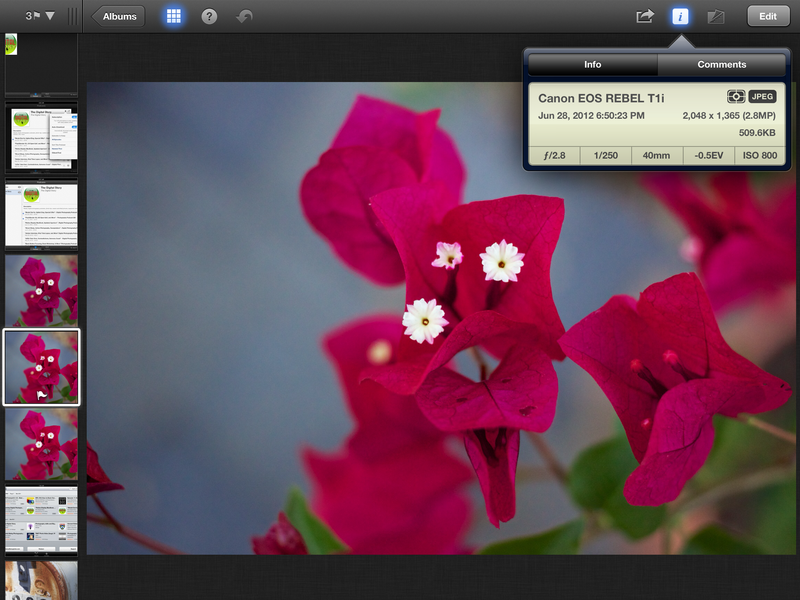 The bottom line here is that Aperture and Lightroom are better tools than iPhoto for exporting pictures. They offer more control over the process itself, especially concerning the pixels-per-inch setting. In our testing, both color and detail were noticeably better from Aperture and Lightroom output, than from iPhoto. 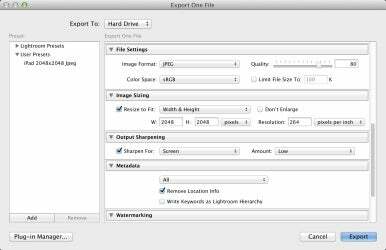 To export from Aperture, begin by going to File -> Export -> Version. Then, in the Export dialog box, click on the Export Preset popup menu. You’re going to create a new preset specifically designed for iPad output. Go all the way to the bottom of the menu and choose Edit. The dialog box that follows will allow you to create the new preset. Click OK to exit the setup and return you to the normal Export dialog box. Make sure that your new settings are selected in the Export Preset pop-up menu. Once you’re ready to go, click the Export Versions button in the lower right corner to begin the process. Aperture will create files to your specifications that will look beautiful on the new iPad. Once you’ve selected the image in Lightroom, go to File -> Export. 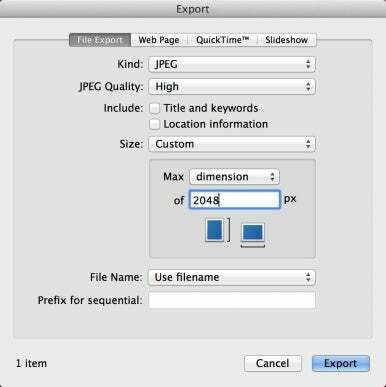 The areas you want to navigate to in the Export dialog are File Settings, Width & Height, and Output Sharpening. Use the same settings here that you did in Aperture, except for JPEG Quality amount, which is 80 for Lightroom. 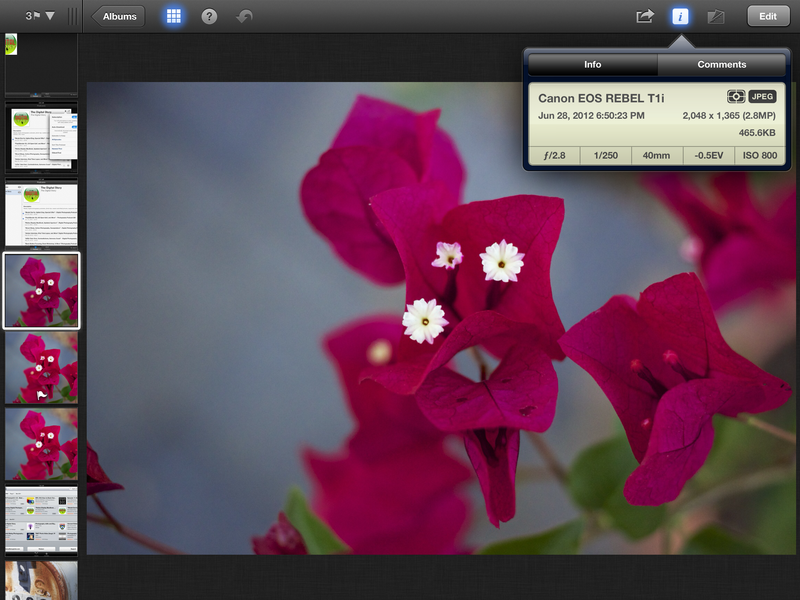 This gives you approximately the same quality and file size as 9 does for Aperture. Kind: JPEG; JPEG Quality: High; Size: Custom Max: dimension of 2048 pixels. Click the Export button. Since you don’t have any control over output resolution in this dialog box, the files will most likely have the default 72 ppi setting. You now have a set of images carefully crafted to your specifications. 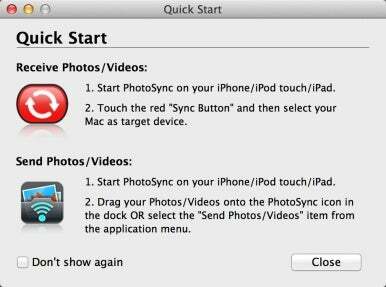 My favorite app for moving them to the iPad is PhotoSync ($1.99 in the iTunes App Store). It wirelessly receives images sent from the Mac to the iPad. (There’s a free companion Mac version in the Mac App Store that you use to send the pictures.) 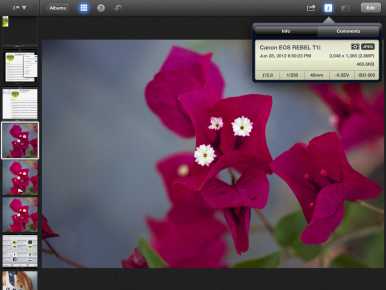 Your pictures appear unaltered in the Photos app on the iPad and in its Camera Roll. 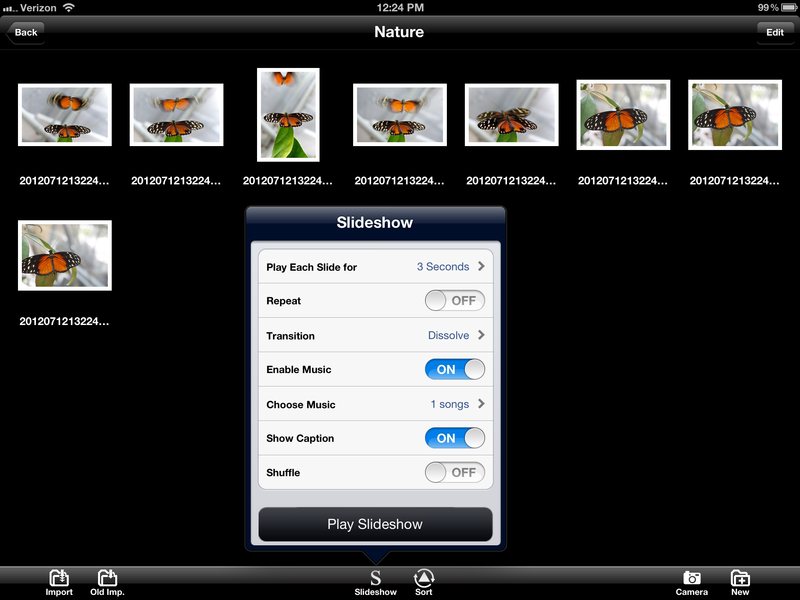 They can now be accessed by other applications on the iPad, such as your favorite portfolio app or iPhoto for iOS. Here are some display options for your beautiful pictures. The basic Photos app does a fine job of displaying your pictures. You can look at the images one by one, or use the slideshow player. There are five transitions to choose from. And you can select a song from your iTunes library to accompany the presentation. It’s free and comes loaded on every iPad. iPhoto for iOS ($4.99) has a good slideshow function that allows for more customization than the Photos app. Tap the Share button on the top right side of the interface, then tap the Slideshow icon. First select the images you want in the presentation via the four options: Selected, Flagged, All, or Choose. Next you have eight cinematic themes ranging from Ken Burns to Sliding Panels. They come with their own musical theme also, or you can pick a song from your iTunes library. The total impact can be very effective. Photo Manager Pro ($2.99) for the iPad can handle both file transfer and the image presentation (although I think PhotoSync is easier for transfer). You can swipe from picture to picture and pinch to enlarge. Or you can set up a slideshow that provides options for slide duration, transition style, music, caption, repeat, and shuffle. It’s a great all around organizer and presentation tool for the iPad. Portfolio Pro ($9.99) is a full-fledged presentation app that provides many options for organizing groups of photos and showing them. You can create unique galleries, add your own branding, choose from a variety of customizable themes, and of course show slideshows. Great for photographers who need a flexible, powerful app for client presentations. If you like to “pinch-zoom” your images for a closer look at the details, you might want to add a few pixels to your images while preparing them on your Mac. I had good luck doubling the resolution numbers from 2048-by-1536 to 4096-by-3072 pixels. This allowed me to magnify the image more on the new iPad for a closer look. But keep in mind that the file size goes up too. 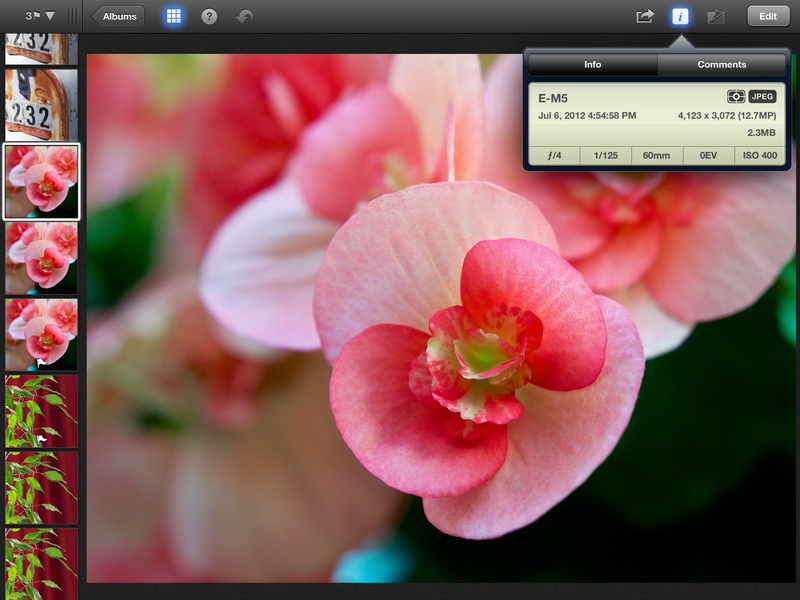 My begonia image at 2048-by-1526 (3.1 megapixels) took up 662.6KB on the iPad. When I increased the image resolution to 4123-by-3072 (12.7 megapixels), the file size rose to 2.3MB. That’s a fairly high price to pay for a little extra zooming capability. By the way, files at the older 1024-by-763 resolution won’t zoom at all. But they look remarkably good at 100 percent on the new iPad. Like I said, the display is pretty good. So it really comes down to how important subtle detail is to you, how much you want to zoom in, and how much storage space you’re willing to sacrifice to do so. My recommendation is to take advantage of the Retina display’s packed pixels and start importing your images at the 2048-pixel width. And unless you have special needs for extended zooming, I see no need to go beyond that resolution.